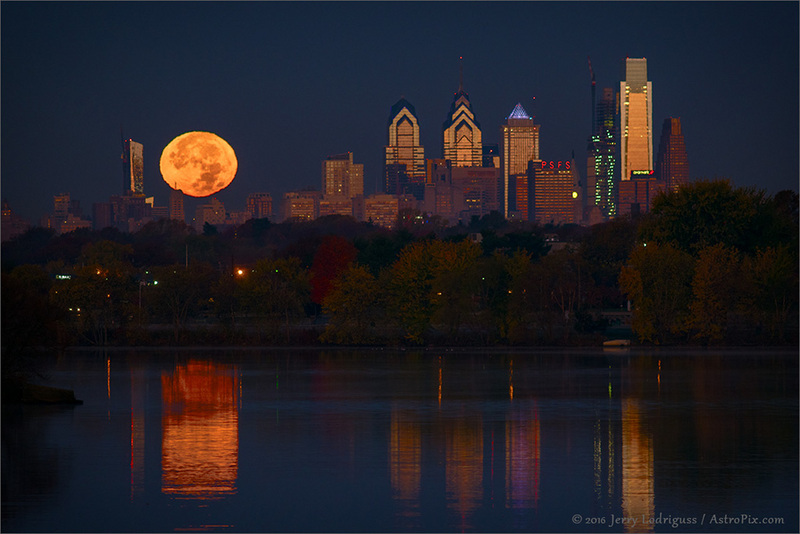 Explanation: A supermoon sets over the metropolis of Philadelphia in this twilight snapshot captured on November 14 at 6:21am Eastern Standard Time. Within hours of the Moon's exact full phase, that time does correspond to a lunar perigee or the closest point in the Moon's elliptical orbit around our fair planet. Slightly bigger and brighter at perigee, this Full Moon is still flattened and distorted in appearance by refraction in atmospheric layers along the sight-line near the horizon. Also like more ordinary Full Moons, it shines with the warm colour of sunlight. Joined by buildings along the Philadelphia skyline, the perigee full moonlight is reflected in the waters of the mighty Cooper River.